Not a great day at the office for our Secretary of State and his advisory-ing ways. 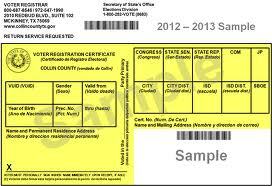 Almost two weeks after calling into question the citizenship status of almost 100,000 registered voters, Texas’ new chief elections officer, David Whitley, defended his office’s decision to hand over those voters’ names to law enforcement around the same time his office was also acknowledging to local election officials that the list of names could contain mistakes. At a Senate hearing to consider his confirmation as secretary of state, Whitley vacillated between telling lawmakers he referred the list of voters to the attorney general’s office because his office had no power to investigate them for illegal voting and describing the citizenship review efforts as an ongoing process based on a list that still needed to be reviewed by local officials. But he made clear is that his office knew from the start that the data could be faulty. “I can tell you senator that 100 percent my reason for transmitting this data to the attorney general’s office was to ensure that these lists were as accurate as possible,” Whitley said to state Sen. Kirk Watson, D-Austin. Sitting before senators in a packed committee room, Whitley faced blistering questions from Democrats for the better part of two hours. After brief opening remarks in which he touted his long career as a public servant, he somberly defended the controversial citizenship review efforts he ordered. But at times he struggled to answer technical questions about the flawed data at the heart of it. “You were the one who made the referral and blasted it all over the state,” Watson said. See here for the background. It goes from there, and it never gets any better for Whitley, who mostly comes across as unprepared. As discussed, he will need a two-thirds vote of the Senate to be confirmed, and right now he doesn’t look to be on track to win over any Democrats, from whom he will need at least one vote to clear the bar. As I understand it, if he does not get confirmed, he will serve till the end of the legislative session, then Abbott will have to name someone else. The last time I can recall such an appointment getting scuttled was in 2011, when we had the fortunately-doomed nomination of David Bradley to the Forensic Sciences Commission. Before that was the 2009 nomination of Don McLeroy as Chair of the SBOE. I don’t care who you are in Texas politics, those are not names you want to be associated with. Anyway. It’s still early to say what will happen for sure, but David Whitley didn’t win anyone over yesterday. See Progress Texas’ Twitter feed for in-the-moment coverage, and the Chron editorial board, which calls for Whitley to be rejected, has more. He needs to be rejected. It was absolutely inexcusable the way he jumped the gun on that voter list. There needs to be serious consequences for this sort of failure. I don’t expect the GOP to mend their ways on voter suppression. I do expect the Dems to prevent any easy going for them. I would like to see a report on the number of collective hours and cost spent by the 254 County election clerks on this complete cluster from the Secretary of State. I think Whitley did a good thing!!! Even if only 1000 voters should not have been allowed to vote, that needs to be corrected. Surely doesn’t seem such a big bad deal for county election administrators to check their rolls.